Guest contributor Frank Maloney (aka. 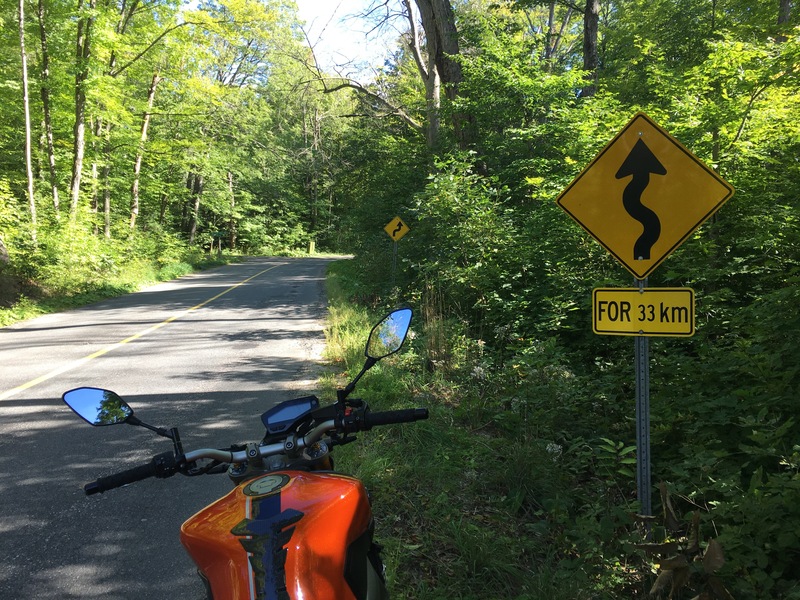 “The Professor”, aka “The Navigator”) brings us 4 great motorcycle loops that can be done individually or combined as a full day ride from anywhere around the Greater Toronto Area (GTA). Starting from Buckhorn, make your way to Hwy 507 North towards Gooderham. This road is curvy, fun but has a fair amount of traffic. Once you are at Gooderham take Hwy 503 to Tory Hill where you take Hwy 118 through the interestingly named Cheddar. At this point you can take 48 south to 28 North, or stay on Hwy. 118 until it hits Hwy. 28. This is very scenic and nice roads but some traffic. On Hwy. 28 go east towards Bancroft until you hit Lower Faraday Rd. Lower Faraday Rd. is full of whoops and level changes with little traffic. Pavement is a little degraded, but well worth the ride! Once at Coe Hill turn right on 620/504. This is a very nice curvy road! If there is traffic it’s tough to pass. Take the 504 branch south (620 is not nearly as fun). At this point if you are done you can continue to Hwy 28 South to Burleigh Falls and then back to Buckhorn/Bobcaygeon. If you don’t mid a bit of a long ride back to launch, Route 46 is quiet, straight and fast. You can easily combine/connect the previous Kawarthas East Loop with this Haliburton loop, as they overlap somewhat. Keep in mind that in Haliburton, fuel stops are few and far between so manage your fuel accordingly. A good spot to begin the Haliburton loop is in the town of Minden. Avoid Route 16 going to hwy 1, as it is residential and does not have many curves. If you like your rides to be vertical, then Bobcaygeon Rd. will be a riot for you. This will take you to Hwy. 118 which you take east to Carnarvon. At this point, a fun and twisty cottage road (some sand at times though) is route 11 north to Halls Lake where you can take 35 southeast back to Carnarvon. Once at Carnarvon stay on 118 to West Guilford where you can take the fast route 6 or twister 14 which both arrive at Eagle Lake. From there, take 14 to Fort Irwin (fuel stop here). Take 19 back to Haliburton. This has tight curves, elevation changes, watch for sand/gravel and construction. Back at Haliburton go east on Hwy. 118, higher speed and scenic. You can take the very curvy and fast route 3 south to Gooderham to 503 North. A great side cottage road can be accessed on route 3 (Glamorgan Rd. ), it is Ursa Road. If you stay on Hwy 118, you then take route 4 to Wilberforce. Follow this to Route 10, Elephant Rd. (also called Peterson Rd.) which is a favorite with high speed turns and an exhilarating ride to Maynooth. From here, loop back on the excellent Elephant Rd. to Wilberforce. Alternatively, if you want to access Lower Faraday Rd. and Eastern Kawarthas loop, take route 648 through Highland Grove then 118 east. For a fun little mini-loop, Route 9 to Hwy. 28 to 9 North or 48 (Dyno Rd.). You are now back at Cheddar and can take the leisurely Hwy. 503 all the way to Kinmount or take Route 3 (Glamorgan rd.) back to Haliburton. This loop starts past Orillia on Hwy. 11, in Severn Bridge. When you see Luigi Rd. it is time to take next exit and turn around to begin the loop (this assumes you are coming from the south). There is a gas station and abandoned restaurant next to a gravel pit where you can park if you are trailering. Begin the loop by taking 19 west to Southwood Rd (Route 13). Southwood Rd. is very fun with curves, level changes and some traffic (on weekends). Watch out for loose sand and gravel, particularly in the spring as the road has sharp corners that can be quite very nasty when slick. This road is a good 20 plus km of fun, twisty road. It ends at Bala on Hwy. 169. It is a 10 km ride on 169 which has a fair amount of traffic and law enforcement so be on your best behaviour. At Glen Orchard take Hwy. 118 West to Port Carling. Past there, you take Route 25 to Brackenrig. Take Route 4 East to 35/4 south to route 47. These are fun, quiet roads with good curves and decent pavement quality. 47 Will take you back to Port Carling where you can loop back to Bala and Southdown Rd. Alternatively if time is on your side you can continue to the Rosseau Loop as they connect. This is a personal favorite loop and is best accessed from the previous first leg of the Bracebridge Loop. After Glen Orchard, Take Route 7 through Minett. It then becomes the glorious Route 632 a very nice road with good pavement and curves with elevation changes. This will bring you to Rosseau. At Rosseau, if you need fuel you can loop east about 10 km to Bent River. If not then hop onto Route 3 (Aspdin Rd.) a fun, curvy road itself that takes you to Route 31 North which you can take to 45 and to 2. These are fast roads with some challenges with sand and gravel and general road deterioration. Hwy. 2 will get you to Sprucedale where there is a general store to have a water and ice cream. There is a gas station just east of town. Now get ready for what is one of the top 3, if not the top motorcycle road in Ontario: the legendary Route 518 (Bear Lake Rd.). This is simply a nirvana of level changes, increasing and decreasing radius curves over 28 km of beautiful pavement with little traffic and minimal enforcement. It seems more fun to ride this road from east to west than west to east but you may want to do it back and forth a few times to get the hang of it. You emerge and pass through Orrville west to turn back south on Tally-Ho Swords road, an excellent road that curves and sweeps down to Hwy. 141 back to Rosseau. At Rosseau you can double back or if you have time, access the Bracebridge Loop. Ride safe and enjoy some of the great roads Ontario has to offer!